Costs – Madison homeowners need to do regular arbor maintenance and rare tree removal. Find out what the average cost is for these services, in addition to stump removal. FAQs – Need to know what the tree culture is for Madison, Wisconsin? Find out more information on tree rules and regulations, thriving trees, and diseases to be aware of in the area. Services – Our list of professionals in the Madison area can help you with your trees immediately. Call today. How Much Do Tree Services Cost in Madison? Tree care in Madison, Wisconsin can be both fulfilling and a challenge. Active care maximizes the longevity and benefits of trees while minimizing their hazards and special vulnerabilities. From routine maintenance such as pruning to tree and stump removal, there are many public and private resources available to owners in Madison for meeting their tree care needs. Here are the average local costs. Like other living things, trees can get sick and eventually will die. Tree removal is usually deemed a last resort, but it may be necessary when arbors become afflicted by disease, pests or simply old age. In general, homeowners can expect tree removals to cost more than ordinary maintenance procedures. In Madison, the average cost for tree removal is just over $850 with relatively few paying more than $980. Some people report paying as little as $350 or as much as $1,100 for tree removal. Stump removal is one of the most involved and dangerous tree services, but it is a necessary step in the removal of a whole tree. Removals are usually priced on a per-stump basis, including both labor and equipment costs. The average price of grinding and removal in Madison is about $110 for a medium-sized stump and $113 for a larger one. Difficult or dangerous jobs typically cost more due to the added risk, reaching nearly $145 for a single stump. While it may seem counter-intuitive to direct the growth of trees, active pruning and other maintenance procedures are necessary to ensure landscape trees’ health and human safety in urban settings like Madison. The average cost of a maintenance procedure such as pruning or fertilization in the United States is approximately $485. Most pay between $390 and $580. The priciest maintenance procedures, however, approach $1,000. The seat of Dane County in south-central Wisconsin, Madison is known as the “City of Four Lakes,” and on the shores of those lakes are abundant forests, many full of hickory, pine and silver maple trees. Urban Madison, for its part, hosts noteworthy arbors like the Spring Tavern black walnut and the internationally famous Pleasant Company oak in the Middleton area. Madison and surrounding areas harbor numerous large trees designated as state champions due to their prodigious heights or circumference. 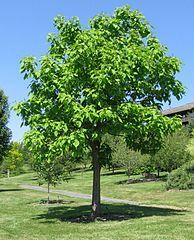 These include specimens of the eastern cottonwood, red oak, American elm and black walnut. Oak trees have historically dominated Madison, and many older than 200 years can be found in the city today. The oldest tree in Madison is a 266-year-old red oak. While oak trees are a major part of Madison’s heritage, many need extra care because they are vulnerable to the effects of oak wilt disease and urban soil acidity including street limestone treatments. The Forestry Section of the municipal government is responsible for large trees on public property within city limits. The City does not work on private land, unless such trees are afflicted with a disease that could spread. Property owners must pay for their own removals and routine maintenance. Street trees and those lining public rights-of-way like the sidewalk are cared for by public maintenance crews. The City of Madison will respond to maintenance requests by sending inspectors to assess, remove or replace street trees at no charge to the adjoining property owner. If residents want to plant new trees in the space between the curb and the sidewalk, they must adhere to planting specifications set by the City. Trees on private property that overhang or otherwise encroach on a public right-of-way are not maintained by municipal crews unless the City’s Building Inspection Unit deems them a danger to public safety. If a privately-owned tree near the street falls into the right-of-way, the Parks Forestry Section will clean up only the parts lying in the public domain. Wisconsin common law holds that trees which cross boundaries to span multiple properties are the joint possession of the adjoining owners. Additionally, if a tree on private land intrudes into the path of power lines, the utility company has the right to prune and, if necessary, remove the tree altogether for clearance purposes. Madison, like the rest of Wisconsin, hosts a humid, continental climate suitable for a variety of tree families from softwood conifers to deciduous hardwoods. Madison is nestled in the southeastern Wisconsin Savanna and Till Plain where typical Midwestern temperatures prevail. Each season is distinct, but the summers aren’t quite as warm as the winters are cold. 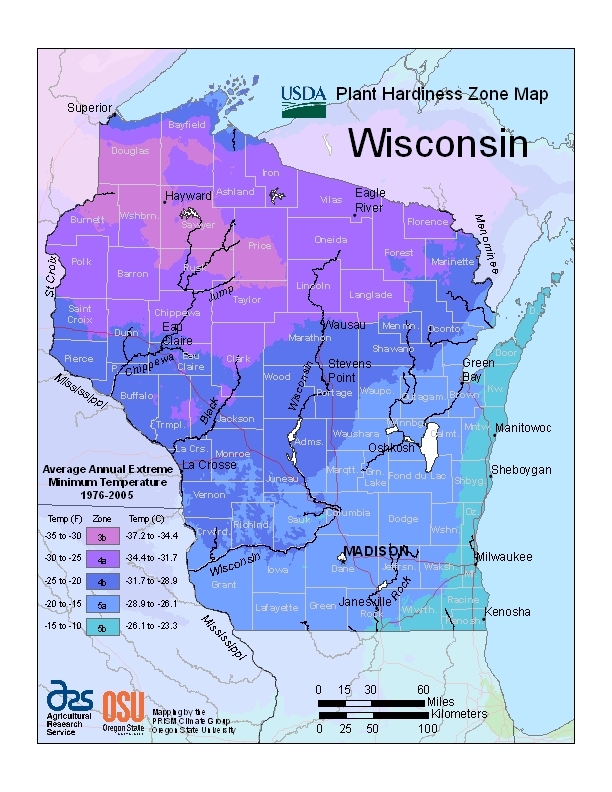 Madison, Wisconsin is found within USDA Hardiness Zone 5a. Though the winters can be harsh, fruit trees can thrive here, mainly by blossoming before the fall frost. Reliable cultivars include apple, Asian pear, cherry and plum trees. Growers also report success with hardy varieties of peach, mulberry, apricot, paw paw and persimmon. The presence of the emerald ash borer was first noted towards the end of 2013 in Madison, which is home to nearly 20,000 ash street trees. The City offers a Homeowner’s Toolkit for dealing with ash trees infected by the deadly borer. 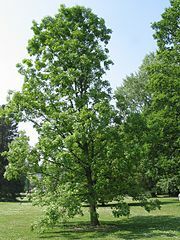 Additionally, local oaks and elms have proven vulnerable to tree afflictions over the years, especially Dutch elm disease and oak wilt disease. The City considers trees and wood affected by these diseases a public nuisance that must be removed in a timely fashion.